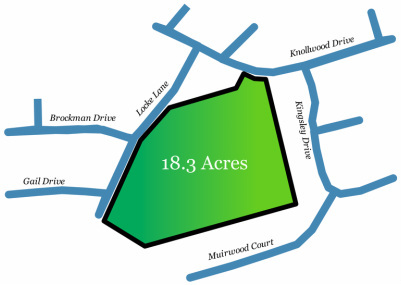 Knollwood is home to 18.3 acres of woodlands certified by the American Tree Farm System. Owned by Erskine College Professor of Biology Dr. Mary Lang Edwards, the forestland is preserved for her study of the Eastern box turtle. Edwards has been testing the homing abilities of the box turtle. Fitted with transmitters, more than 100 turtles are tracked using "radio telemetry." In 2007, she told Erskine NetNews of a female turtle that got caught in a flash flood at a nearby creek, ending up at least one-half mile from its usual location. The trek back home took several days, and instead of following the creek back home, the turtle took a more direct route. Although many female turtles leave their home range to nest, they always return to their home area, she said. A member of Erskine's faculty since 1989, Edwards also tracks turtles in a 100-acre tract of woodland in the Due West area – land that was donated by a benefactor for use by Erskine biology professors and students. The American Tree Farm System is the largest and oldest sustainable family woodland system in America. In order to be an ATFS member, you must own at least 10 acres of forestland, implement a written forest management plan, follow the American Forest Foundation's Standards of Sustainability for Forest Certification, and have the farms inspected and certified every five years by an ATFS forester.